When someone talks about having correct finger placement when playing a orchestral stringed instrument, they are typically referring to two things: how you place your fingers on the strings and where you place your fingers on the strings. Building good finger placement habits is extremely important for playing in tune and with ease. West Music has been working with musicians and music teachers for over 75 years. In that time, we’ve learned a few tricks to help you or your student play like a pro. One tip we give new players is to use finger tapes. Violins and other orchestral stringed instruments do not have frets like guitars. That means there’s no visual guide to help you determine where your fingers should go. We’ve found the easiest way to get around this issue is by placing finger tapes on the fingerboard. We like to think of finger tapes like training wheels; eventually they will come off because you will have developed “muscle memory” to recall exactly where to place your fingers. As a beginning violin player, the initial hand position you will learn is called first position. First position allows you to play the first five notes on each violin string. To get your hand into the right position, turn your left hand towards you and curl your fingers like you are examining your fingernails. Now, slightly spread your fingers apart. As you do this, you will notice that there is a naturally wider gap between your 1st finger and 2nd finger (index and middle) as well as your 3rd and 4th finger (ring and pinky). You will also notice that there isn’t a very big space between your 2nd and 3rd finger (middle and ring). Now pretend that your hand is in this same position, but curl it around the neck of your violin. Place your first finger about two half-steps up from the nut, and there you have it! First position. In this relaxed position, there are two half-steps between your 1st and 2nd finger, one half-step from the 2nd to the 3rd finger, and two half-steps between the 3rd and 4th finger. If you were looking at the strings on the viola from left to right, the string on the far left would be the thickest as well as the lowest-pitched string (C String). The strings ascend in perfect fifths until reaching the far-right string which is the thinnest and the highest-toned string (A String). Keep your right hand relaxed around the fingerboard and your wrist gently rounded. Take care not to rest your wrist on the viola’s neck. Maintain a curved, open space between the thumb and index finger, so that it makes a backwards “C” shape. 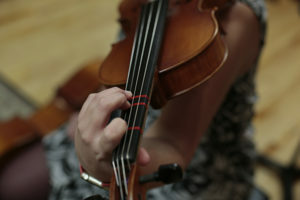 From this position your fingers can move easily and hover over the strings comfortably. The double bass is the largest instrument in the orchestral string family, correct hand and finger placement is especially important. 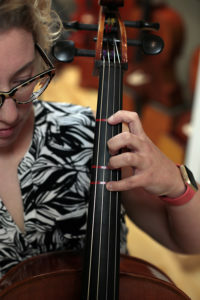 Similar to the cello, proper hand placement includes your thumb opposite of your 2nd finger on the back of the neck while your hand forms a curved “C” shape. 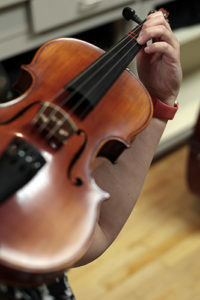 Your thumb shouldn’t squeeze the neck of the bass or fully support the weight of the instrument, and it is advised to have the instrument lean slightly forward. This can help your fingers press down on the strings while preventing your thumb from squeezing at the same time. By keeping your hand balanced and curved into a “C” shape, this also allows the fingers to push down without the support of the thumb. 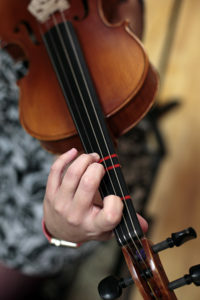 To form the proper cello hand and finger position, place your fingers tips on the string. Your thumb should be placed on the back of the neck, directly opposite from your second finger. By positioning your hand in this way, it should form a curved “C” shape with your fingers. 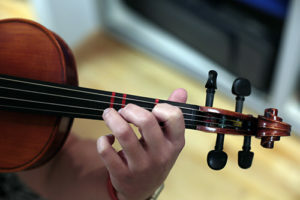 As with the other string instruments, using finger tape on the fingerboard is a smart way for beginners to memorize the placement of different notes. 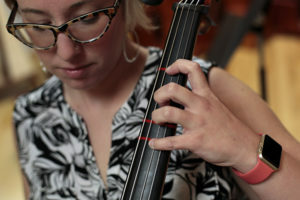 On the cello, the tape is usually used to mark a regular 1st finger (the E note on the D string), 2nd finger (the F note on the D string), 3rd finger (the F# note on the D string), and the 4th finger (the G note on the D string). No matter what string instrument you play, correct finger placement is vital to play in tune and have a clear sound. By learning and practicing the correct technique from the very beginning, you are laying down a good foundation and ensuring future success with your instrument. West Music Commitment to You! We at West Music have a motto: Play Now. Play for Life. We believe that everyone should have the opportunity to learn to play and enjoy music. As part of this commitment, West Music’s Orchestral Division offers a wide selection of hand-selected, quality stringed instruments for the beginning, intermediate and advanced musician. With options to rent or purchase your instrument, it’s never been easier to play!